Corero is a network security company and is the leader in real-time, high-performance DDoS defense solutions. Service providers, hosting providers and digital enterprises rely on Corero’s award winning technology to eliminate the DDoS cyber threat to their environment. 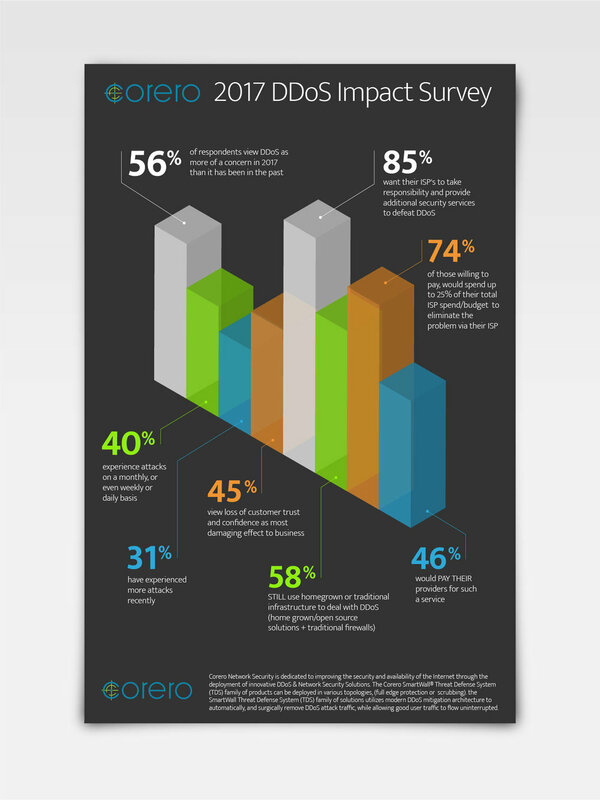 Corero had polled top technology decision makers and security experts at the 2017 RSA Security Conference and needed a clear and concise way to visually convey their findings. In partnership with Elevate Communications, StudioRd Design had the pleasure of visualizing the 2017 survey - distilling the information into distinct, digestible pieces of content that could be shared individually as standalone statistics or collectively in one infographic. Animated versions helped to increase engagement across a wider subset of audience demographics on social media channels.